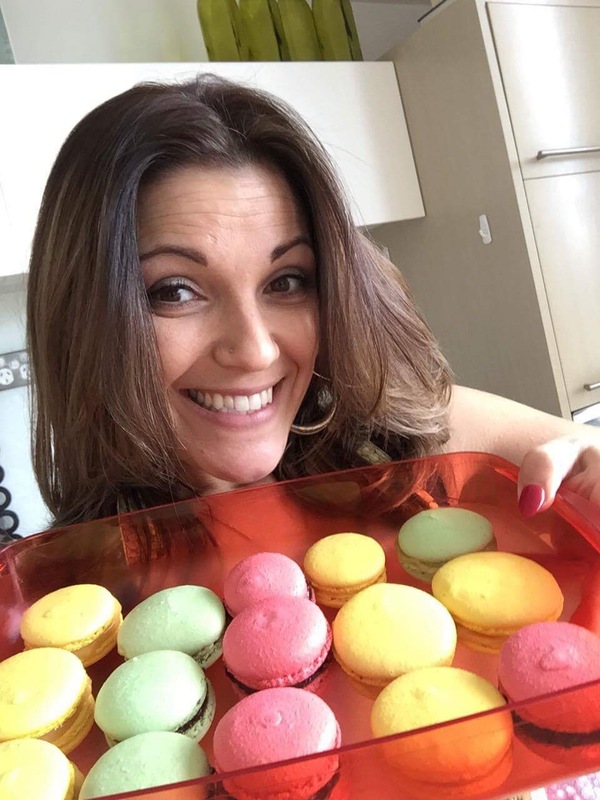 Maria and macarons – Happy baker! So my friend Maria wanted to learn to make macarons – like me she had tried on and off. Honestly, it takes one good macaron class, the right recipe and learn one teach one and off you go to success. What’s your macaron making tip? 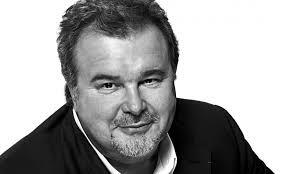 France is Pierre Hermé and his recipes are readily available on the internet. This is a great post from Dessert First using not only the recipe but hints from SF Cooking School. Always, but always, “age” your eggs. I separate my eggs from my yolks a week before and then let them stand at room temp two days prior to baking. This breaks the albumen and allows for a better meringue when you need it most. Mise en place is essential – there are steps in macaron making that will not wait for measuring, cooking….see how macaron can be zen. The mise is part of the zen – the prep part. Maria and macarons c’est finis – Happy baker! Hermé’s recipe is based on an Italian meringue that is egg whites whipped to soft peaks with simple syrup (sugar and water) boiled to 118F. This my friends is an entire post of it’s own and also readily available on the internet. Try making macarons with “uncooked” meringue and let me know how it works for you – cause I never got it to work. Use gel or powder coloring – that liquid food coloring from the grocery story added to egg whites does not work. And always use more color than you think you’ll need – remember you are going to add a massive amount of WHITE egg whites and it will dilute your color – dramatically. Piping macaron shells does not require a template of circles but it does require practice and it’s fun. 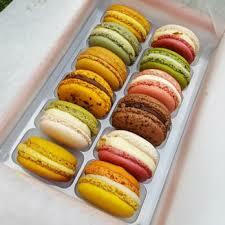 So practice away – unless you are working in the Hermé kitchen doing these 8 hours a day – expect a few rejects. And any true friend who won’t help you try a new filling on a reject is not a true friend who should be grateful you are making macarons and sharing with them at all. Oven temp makes a difference – like it does for any recipe – this more than others cause they’re macarons! And they’re made of egg whites and sugar and they cook quickly and burn easily. If you can smell them – they’re probably over cooked. Use a digital scale – Measure everything – this like many pastry recipes is not an eye ball it kind of thang. Let the lava flow – when you combine the meringue with the almond flour and sugar – when mixed properly and enough – it should have the consistency of a lava flow – not faster or slower. This will be the test as to how your shell piping will go. Too loose = soup. Too hard = won’t get through the piping bag. Stop mixing when you get to lava…..I do this by hand not in an electric mixer. Let the “skin” form – I have done it both ways – without letting the macaron shells “rest” before baking and with a rest. I find the classic macaron “foot” is guaranteed if everything else is followed. Yes there are people on the internet who say it doesn’t matter – I respectfully disagree. Macaron shells freeze! Yes make a bunch, freeze and fill as needed. Show up with a hostess gift that will wow them! Patience grasshopper – macaron making takes time and patience. It can be very zen if you don’t rush and don’t get frustrated. This is a great weekend project. Or one day on the weekend. I make a bunch of shells freeze them and then make a couple batches of small fillings as I need for a friends party, dinner or make someone feel special. What’s your macaron tip or learning? Entry filed under: Food!, Shared Posts, Stuff I Love. Tags: Baking macarons, Macaron madness, Pierre Hermé macaron recipe, Tips for making macarons, Zen and the art of the macaron.